Live was made for creative DJ’s first, but since version 8 has a built in livelooping tool. It is also the host which is most often used to host other livelooping plugins. It’s not cheap, but it’s often bundled free with hardware and there is a Lite version with a limited number of tracks. You can quantise the loop to the current BPM, or have it set the tempo depending on your signal. It can also mute the input so the channel only plays back the loop, not the input signal. You can run as many loopers as you like, (depending on your CPU power) and can have them on separate tracks, or on one track inside an effects rack. Like any looper, you need to work with it to discover the idiosyncrasies, but like all loopers, it allows (and requires) you to develop your own voice or style. If the loop is running, it will have a BPM. If you record a new loop while play is running, it will pitch-shift your input to fit the length, so unexpected results take place, however, further as you add further loops, you will naturally play them to it the initial playback and overdubs are no longer pitch-shifted..
Midi control requires a programmable foot-pedal such as the FCB1010, where I use the two pedals to control speed and feedback. 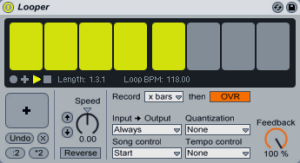 Since Ableton won’t accept PC (program change) messages, loopback devices such as Loopmidi or Midi-Ox allows you to control the looper using a standard midi PC pedal. The play/overdub/record is controlled via individual buttons, or a single footswitch, which alternates between play/overdub, with a double press triggering stop. If you have lots of pedals, assign one to each function. If you’re limited, use the single button and get used to how it works! There are many musicians out there using Ableton and the real joy is that each of them will use it in different ways, it is a truly musical tool. My site has numerous posts about this area….